WRAPUP: It was wet.. very wet, but the worst weather held off till the end. The good news is that the moisture kept the crowds away at Long Grove and the 23 MINIs that braved the weather had the place mostly to ourselves. Francis planned a well paced drive covering a bunch of fun suburban roads and a few twisties thrown in.. Only snag was the difficulties getting out of the mall and to the first road (all my fault). It was great to see so many new faces out for their first drive, plus lots of old friends!! Send links to photos to steve@chicagominiclub.com , and I will link them in here. Come on out for a fun drive in the northern suburbs. We’ll be looping around and sampling a bunch of twisty roads, and ending in Long Grove for a bit of hanging out or shopping. 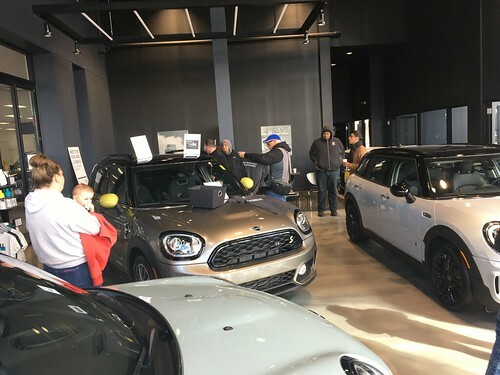 David from www.go-part.com has contacted us and offered Chicago MINI Motoring Club members a 20% parts discount from their website. One more great reason to be a member of the Chicago MINI Motoring Club.